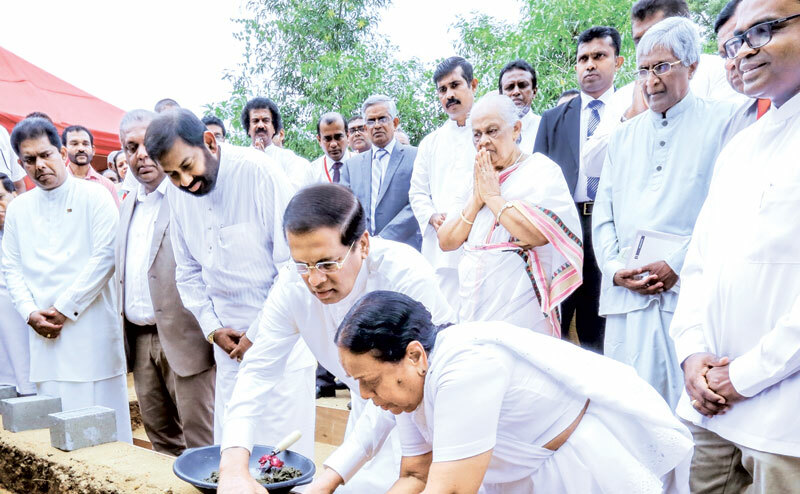 ‘Amaradeva Asapuwa’, a musical hermitage which had been a dream of the late maestro Amaradeva had its inauguration at Ape Gama premises in Battaramulla recently with the participation of the President Maithiripala Sirisena. Spread over an area of 120 acres, Amaradeva Asapuwa will comprise of an archives, a library and a museum in addition to facilitation for musical experiments for veterans here and abroad. The place will offer entertainment by music virtuosos from all around the world who will perform for lovers of high caliber music. At the inauguration, Evergreen Saraswathi eulogy Jagan Mohini sung by the late Maestro was played in harmony with a dance act by female dancers. Finance and Media Minister, Mangala Samaraweera said late Pandit Amaradeva was a great scholar and a researcher of music who rendered an undying service to the nation and beyond. “Amaradeva Asapuwa will open a new chapter in the local music sphere creating new vistas in music. I am privileged to participate at this noble event as the Media Minister. Amaradeva Asapuwa will facilitate budding musicians and senior musicians to learn from the ocean of knowledge late Pandit Amaradeva gifted the nation without letting it confined to the domains of the history. The place will groom a new Amaradeva lineage,” Minister said. The Minister thanked the former Media Minister Gayantha Karunathilaka and Deputy Minister of Parliamentary Reforms and Mass Media, Karunarathna Paranawithana for facilitating the process of commissioning Amaradeva Asapuwa by coordinating with the President. Professor Sunil Ariyaratne said Mahavamsa says, Sinhabahu’s mother Suppa Devi made everything she touches turn gold and likewise late Pandit Amaradeva made every piece of music he made a golden one. “In his lifetime of 88 years Amaradeva was respected, praised and honored by scholars, state sector and people of all walks of life as a living God. Amaradeva dedicated his whole life towards creating a very local authentic music tradition. He did musical experiments via radio, stage and cinema towards this object and wrote books and articles as regards his experiments on music. Thus he is a musical genius,” he said. “He was bestowed with ‘People’s Artiste of the Year’ award consecutively for six years and when he received the award in 2015 he was at the age of 87.Pandit Amaradeva was conferred with five honorary degrees from five Sri Lankan universities, let alone recognitions from abroad”, Professor Ariyaratne added. Pandit Amaradeva has been the recipient of the Philippine Ramon Magsaysay Award in 2001. Panit Amaradeva’s wife Wimala Amaradeva at the inaugural event of Amaradeva Asapuwa gifted the Magsaysay Award to the President Maithripala Sirisena to be kept at the Amaradeva museum. Maestro Amaradeva was conferred with Indian Padma Sri Award in 2002, Sri Lankan Kala Keerthi President’s Award in 1986 and Deshamanya Award in 1998. In 2003 the French government honoured the maestro with the prestigious Chevalier award. Being a bilingual he represented Sri Lanka in many world forums including the UNESCO 1967 Manila Symposium. In 1972 Pandit Amaradeva composed melody and music for the National Anthem of Maldives on request by the Maldivian Government. An array of mesmerizing songs the maestro has rendered his voice to over the decades and music compositions for songs let alone Operas like Chitrasena’s Karadiya are preserved for posterity.